ArmaghFurniture.com is the holding page of the established home furnishings department at Dalzells of Markethill located between the towns of Armagh, Newry and Portadown. Through more than 50 years of trading as an independent, family run furniture retailer in Northern Ireland, we are proud to offer a wide range of home furnishings including Dinning, Living and Bedroom Furniture in addition to a wide selection of specialist Recliner Chairs with Free Delivery across Northern Ireland and Counties Louth, Monaghan and Dublin in Ireland. Whether you are looking for a day’s cross border shopping in Northern Ireland, or looking for great value and unbeatable aftercare on your kitchen's next table & chairs or complete bedroom suite, be sure to put both ArmaghFurniture.com and Dalzell’s of Markethill on your weekend’s to-do list. ArmaghFurniture.com is currently under construction, but we will be bringing you exclusive deals and promotions in the near future. The website will feature Dalzell’s of Markethill’s extensive line of furniture from a range of desirable brands including Rossmore by McNally & Finlay, Rossmore by Sherry, Bona Vista, Glenwood, Balmoral and Sherborne to name but a few. While the site will feature a wide range of furniture we recommend that you visit us in-store to fully appreciate your choice and for the best deal just 11 miles from Newry, 6 Miles from Armagh and 14 Miles from Portadown. If you are unable to visit please call or email us to Request A Quote for your home furnishing needs. 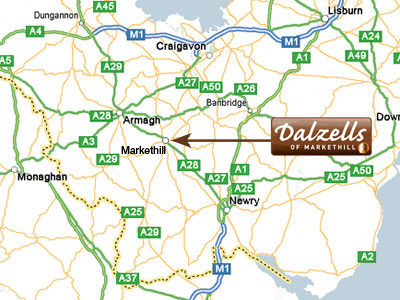 Opening times of the Dalzell’s of Markethill showroom and a map of the Newry / Markethill area are shown on your right.